That's where financial planning comes in. Financial planning is a process that can help you target your goals by evaluating your whole financial picture, then outlining strategies that are tailored to your individual needs and available resources. 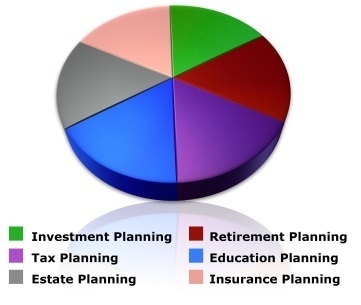 A comprehensive financial plan serves as a framework for organizing the pieces of your financial picture. With a financial plan in place, you'll be better able to focus on your goals and understand what it will take to reach them. One of the main benefits of having a financial plan is that it can help you balance competing financial priorities. A financial plan will clearly show you how your financial goals are related--for example, how saving for your children's college education might impact your ability to save for retirement. Then you can use the information you've gleaned to decide how to prioritize your goals, implement specific strategies, and choose suitable products or services. Best of all, you'll know that your financial life is headed in the right direction. Investment advisors provide advice about investment options and asset allocation, and can help you plan a strategy to manage your investment portfolio. The most important member of the team, however, is you. Your needs and objectives drive the team, and once you've carefully considered any recommendations, all decisions lie in your hands. You can, if you have enough time and knowledge, but developing a comprehensive financial plan may require expertise in several areas. A financial professional can give you objective information and help you weigh your alternatives, saving you time and ensuring that all angles of your financial picture are covered. What if I'm too busy? Don't wait until you're in the midst of a financial crisis before beginning the planning process. The sooner you start, the more options you may have. Each financial plan is tailored to the needs of the individual, so how complicated the process will be depends on your individual circumstances. But no matter what type of help you need, a financial professional will work hard to make the process as easy as possible, and will gladly answer all of your questions. A financial professional is trained to listen to your concerns, identify any underlying issues, and help you find common ground. Financial planning professionals make recommendations, not decisions. You retain control over your finances. Recommendations will be based on your needs, values, goals, and time frames. You decide which recommendations to follow, then work with a financial professional to implement them. Broadridge Investor Communication Solutions, Inc. does not provide investment, tax, or legal advice. The information presented here is not specific to any individual's personal circumstances. To the extent that this material concerns tax matters, it is not intended or written to be used, and cannot be used, by a taxpayer for the purpose of avoiding penalties that may be imposed by law. Each taxpayer should seek independent advice from a tax professional based on his or her individual circumstances. These materials are provided for general information and educational purposes based upon publicly available information from sources believed to be reliable—we cannot assure the accuracy or completeness of these materials. The information in these materials may change at any time and without notice.